Sumac can grow fast and spread to overwhelm the area. Our sumacs are a deep shade of red. I’ve seen some large clusters of sumac here, too. In terms of color, the leaves of ours vary, with red often a component. Even though I was housebound, I can say that 2018 was a foliage bust here in WMass. But I think your late summer and early winter flowers make up for your lack of sumac foliage. One of the early lessons I learned when I started photographing native plants is how different a species can look from one year to the next. I remember going back to a place where I’d found great wildflowers on the same date a year earlier and finding—nothing. While it’s true that our sumacs had a bad year for colorful fall foliage, some other species stepped in to fill the gap. And as you said, we still have a few wildflowers even now. The blackened edges really aid in the suggestion of self-immolation. It’s great to see the warm color in these shots, the fall foliage season was too brief this year. Ah, so like Steve Gingold, you had non-spectacular fall foliage this year, unless it blazed during its brief period. Interesting that you saw the tips of the leaflets as little Brünnhildes. Yes, on a small scale, at least for the sumacs. Some other trees did much better. 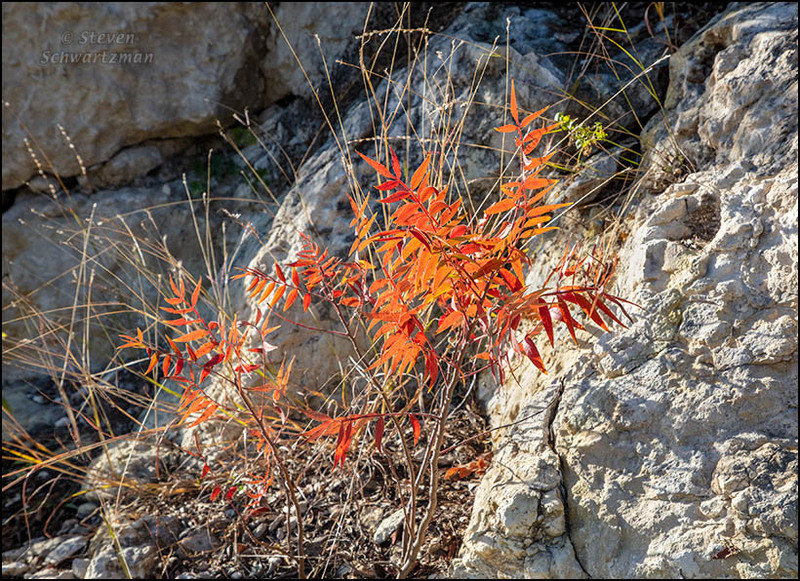 Until I saw these photos and read your commentary, I hadn’t realized that I’ve seen no colorful sumac this year. That’s mostly due to my being stuck here on the coast, where it’s almost non-existent, so I called my friend in the hill country and asked how her sumac had performed. The word she chose to describe it was “blah.” Apparently non-glorious sumac was a thing this year. On the other hand, you should see the possumhaw down here. You may remember my gentle grumping the last couple of years about the lack of berries. This year, no matter which road you take or which direction you look, there they are, and they’re thick. I had no idea there were so many possumhaw trees around. As a special treat, I found my first bright orange one; I didn’t realize the native possumhaw also come in orange. I’m not surprised you got confirmation from farther west on the Edwards Plateau that this was a blah year for flameleaf sumac. And to the contrary I’ll confirm that possumhaw is having a fine time here, as you say it is over by the coast. I’ve photographed several of them over the past month, including two more this morning. The yaupon trees are also doing well this season. In addition to orange possumhaw fruit, there’s occasionally a tree with yellow fruit, which is by far the least common color. I know I once photographed some but in checking just now I see that I never included it in a post. One of my favourite trees in Central Texas for that glorious fall colour. Coincidentally, just this year I noticed a little sapling growing next to an ageing (and declining) pecan in my front yard. I wasn’t sure what it was until this fall when the leaves seemed to catch fire: all red and bright orange. I hope they can be buddies for many years to come. It’s one of my favorites too, even if it didn’t perform this year. I’ve heard of the buddy system; I’m glad to hear you’ve got it going in your yard between a pecan and a flameleaf sumac. Nice to see some colors! Given the dates when I saw these, I’ll have to say you were experiencing grander color at that time than we were. That said, even in this last week of 2018 we have small isolated instances of leaves turning yellow, orange, and red. On the other hand, here on the coast (where I don’t think I’ve ever seen sumac) we had some glorious color from the big leaf maples and especially the vine maple this year. I think it’s the best color I’ve seen since I moved to the coast some 24 years ago. I like the isolated shot of the sumac with the sky for background, but I also like the textures of the rock/cliff and dry grasses behind your first image. Steve Gingold reports poor fall foliage this year in Massachusetts, as far from me to the northeast as you are to the northwest. From what you say, that shift in direction made all the difference. I’m glad to hear it was the best color you’ve seen in your 24 years on the Oregon coast. 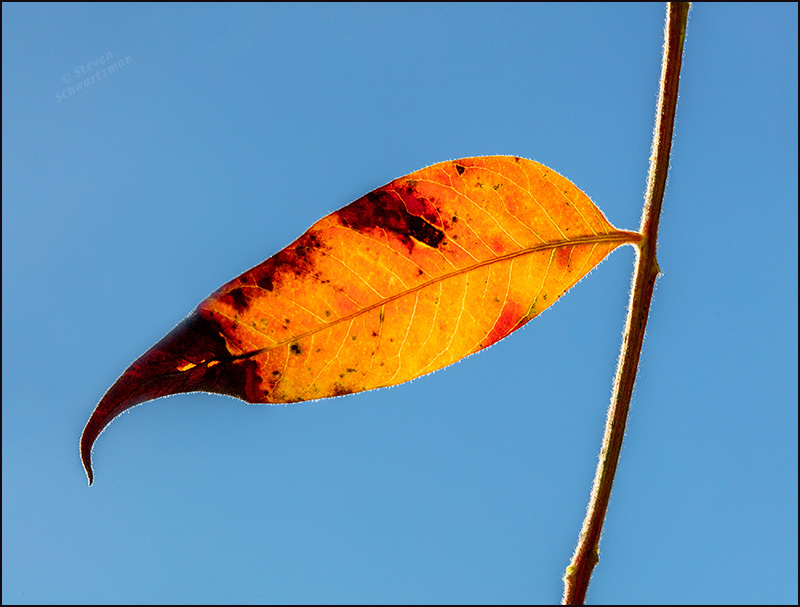 I often try to photograph bright fall foliage against a clear sky to isolate it and of course to contrast the warm colors with the blue behind them. The first picture doesn’t please me as much esthetically but it serves as what I call an informational or documentary image, showing the environment in which the plant was growing. Nice Fall colors Steve! Almost looks like they are on fire! Not for nothing do people call this sumac “flameleaf.” It certainly kindles my photographic fire each fall. 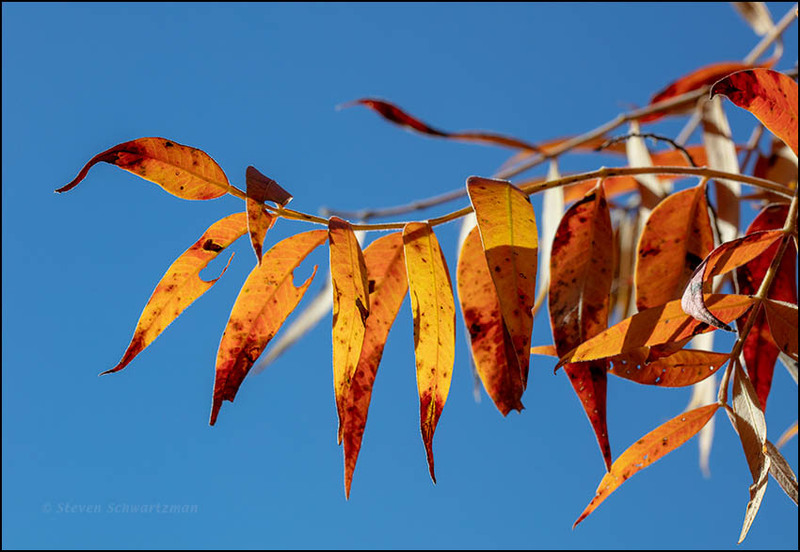 Your photos highlight the glory of the flameleaf sumac, Steve, a plant I am not familiar with. I’m glad you found it and pulled over. While flameleaf sumac grows here, I remember another from New York, and there may well be one in your neck of the woods. You can check the BONAP maps to see. The blue sky complements the orange wonderfully, Steve. The last photo resembles a flag flying at half-staff (I don’t think there is a purely orange flag among this planet’s countries). I mentioned to someone here a few years ago that in the county I grew up in on Long Island the police cars in the late 1950s were painted two-tone orange and blue. I think you’re right about no country having a purely orange flag. You can create an imaginary country and use the leaflet in the last picture as its flag. I’m sorry to hear you sounding pessimistic, Tanja. Lots of wonder still lurks out there. I agree that many wonders remain on this unique and beautiful earth, Steve, but we are wantonly destroying it. What other animal annihilates its own habitat? Thank you for your efforts to help me (and probably you) feel better, Steve . While it is healthy not to think that we know it all, to keep an open mind towards potential beneficial effects of climate change, and not to lose our optimism, it is still very disconcerting to see how loss or modification of habitat has effected many species. It makes me sad because I will never get to see a Passenger Pigeon, a Great Auk, or a Carolina Parakeet (unless they are genetically engineered). May we become better caretakers in 2019 than we were in 2018. Over the last several years I’ve been saddened by the number of properties—at least two dozen—in and around Austin that I’ve lost to development. Of course they weren’t my properties, but they were places where I’d taken nature pictures, in some cases once or twice, in other cases many times. When I see buildings, streets, etc., in those places now, I always remember how the land used to be, and the many native plants (and some animals) I found and photographed there. I can relate to, and am also saddened by, your loss, Steve. Many times I have wished to be fabulously wealthy, so that I could buy up land and set it aside. Fortunately, there are some wealthy individuals or environmental organizations that do just that. More power to them! I feel your sorrow. I want to mention that the 30,000 + acres that got set aside here in Lake county, Il, were a result of voters wanting it. Several decades ago a woman saw wanton development beginning to happen around here, and she started agitating to have some land set aside. A forest Preserve District was created, funds were raised, and now we have a wonderful network of reserves. Some have trails, some are strictly for preservation. Perhaps you can do that where you live? It is inspiring to see what human engagement can do, Melissa. I am trying to keep an eye on the plans for the spot in question, and might join others in trying to mitigate the impact. Error: the domain you requested can not be served at this time. An error report has already been sent to the technical team. Please try again in ten minutes. She may resume her blog there. Thank you, Steve. If she announced this decision, I might have missed it. Right now nothing comes up under Blog on her webpage. It really is inspiring, isn’t it? In fact, it blows me away what a few people can accomplish. I don’t know that I’d have the courage to do it but if others were also committed then maybe. So, here’s what happened. I wanted to create a nifty website connected to my blog, so I upgraded my subscription…and then everything went wrong. I was in quite a battle with WP. Honestly, it seemed like the minute I handed over money they had what they wanted from me and couldn’t be bothered anymore. So I transferred my domain to Format, and am working on a new website there. That killed my existing blog…I didn’t realize that would happen until I did it, although in hindsight it should have been obvious to me. I’m sorry for the inconvenience. I plan to write a blog at the new site, but I don’t know how that will work yet. I am sorry for what sounds like a nightmare, Melissa! I hope you can figure it all out. Thank you for letting me know. Thank you so much, Tanja. Everyone keeps telling me I need a website but most of my paintings sell at galleries, so I’m tempted to forget the whole thing. You should do what feels right to you, Melissa. If you are enjoying the web and blogging, go for it. If not, it might not be for you. On the other hand, it is good for my mind. It really doesn’t come easily to me, so every day I have a puzzle to solve. If these lovely leaves eventually blacken all over ( do they?) we could consider them poster leaves for Orange is the New Black. Why we would want to consider such a silly thing I have no idea but, as we near the end of the year, a little silliness is mandatory. Good question. While I haven’t done a study, my impression is that the leaflets don’t turn completely black. For one thing, most of them loosen while they still have some or even a lot of color, and if I touch a leaflet in the state shown here, it may well fall off. As for a little silliness, you know that that’s fine with me, whatever its colors. The only native sumac I remember in Oklahoma was already bare when we got there in late October. I don’t remember why. It was likely defoliated by rain or wind. I really do not remember asking. The blackjack oaks were still foliated with brown foliage. I remember the sumac because I had never seen them before. I do not know how many specie are native there. Goodness! That certainly narrows it down! I did not bother to look because I figured that there were several specie there. As it turns out, there are only three, and I know it was not Rhus aromatica. It would have been either Rhus copallinum or Rhus glabra. Now I am wondering. I suppose it could have been both. Some seemed to be more stout, with branches that looked like antlers with seeded trusses on top. Thank you for sending that. Sure thing. BONAP is a great resource. I use it sometimes. It was nice for Yuccas, as well as the few spruce and fir in other regions.